Statistics from the National Highway Transportation Safety Administration note that in 2011 there were more than 9.2 million motor vehicle collisions reported to the authorities. It is estimated that all drivers will be involved in at least three car accidents in their lifetime. 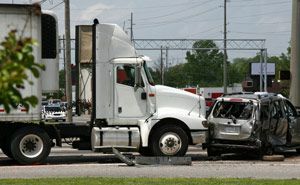 One of the most common types of collisions are those involving passenger vehicles, followed by those involving trucks. Each day car and truck accidents happen, including those involving small passenger cars and large semi-trailers. Many of these accidents are very serious as most large trucks weigh thousands of pounds more than a standard size vehicle. In Illinois there were more than 97, 000 car and truck accidents reported in 2011, overall car and trucks represented 95% of all collisions in the state. The majority of these accidents led to serious car accident injuries and some were fatal. If you or a loved one has been injured in a car vs. truck accident caused by a careless driver, the victim may be entitled to compensation for property damage, medical expenses, lost wages, and more. At the law offices of Tapella & Eberspacher, we can help fight for the justice you deserve. We offer 100% free case evaluations and we only ever get paid when we win. Fill out the ‘Get Help Now’ form to your right for a no-obligation review of your car vs. truck accident claim. The majority of passenger vehicles are similar in size including sedans and sport vehicles. Mini vans and SUVs may sometimes be considered passenger vehicles while other times they may be classified as light trucks. However, heavy trucks come in all shapes and sizes including heavy duty pick-ups, semi-trailers, box trucks, and more. Furthermore, blind spot accidents are more common with cars vs. trucks as many large trucks have what is referred to as a “no-zone”. These are areas around the truck where a truck driver may not be able to spot a car and may collide with them much more easily. Although all drivers are expected to have proper licensing to maneuver any type of motor vehicle, some drivers ignore the rules of the road, are distracted, or simply lack experience. Unfortunately all of these factors can lead to a car vs. truck accident. According to the NHTSA, truck and passenger drivers involved in fatal car collisions commonly had previous DWI convictions, speed convictions, and previously suspended licenses. As there are some types of collisions that are more common among car vs. truck accidents, some injuries may be as well. Of the car and truck accidents in Illinois, more than 98% led to serious injuries. Most car vs. truck accidents are catastrophic and require medical assistance. It is important for anyone who has been involved in any type of accident to seek medical care as some injury symptoms may not arise until hours after the accident. Most car crashes happen in an instant which can leave victims disoriented and unaware of what to do after an accident. Contacting an experienced attorney can help you determine if you may be eligible to make a claim for property damage, medical expenses, lost wages, and more. At Tapella & Eberspacher we are dedicated to helping accident injury victims fight for their right to fair and just compensation. Our knowledgeable attorneys will retain top experts in such areas as accident reconstruction, civil engineering, product design, and toxicology to make a powerful case. …and many more. We also have an office in St. Louis, Missouri serving the surrounding areas. To find out how we may be able to help you with your car vs. truck accident claim, contact us at (855) 522-5291. One of our intake staff members will connect you with one of our experienced attorneys after a few preliminary questions. You can also contact us online by simply filling out the ‘Get Help Now’ form at the top right hand corner of this page – it’s FREE to submit and completely confidential.